Square is an organization with equal emphasis on leadership, technology, quality and passion. It believes in continuous innovation and progress. Its endeavor is to bring the best minds together in a uniquely rich and stimulating environment. Square drives for excellence; the urge to never stand still, to never slow down and to never stop thinking. Square is a corporate giant active in divergent business and industrial fields. Its present unassailable status is the outcome of its successful diversification. Square holds a very strong position as a business leader in this country, and have earned trusted brand image to the people of Bangladesh. When asked Mr. Samason H Chowdhury, why the name SQUARE was chosen, he remembered - "We named it SQUARE because it was started by four friends and also because it signifies accuracy and perfection meaning quality"
Sixty years of hard work and commitment have brought us where we are today. We are keenly aware of our responsibility as the most respected business organization of the country. Our relentless effort is to make Square Hospital worthy of nation's trust and confidence. While many Bangladeshis are going abroad to seek quality healthcare services at a cost of valuable foreign currency, SHL is contributing to reduce this outflow. Samson H Chowdhury is a renowned entrepreneur and a commercially successful person in the history of Bangladesh. Samson H Chowdhury is the founder of the country leading private company, SQUARE. In 1952, he started a small pharmacy in Ataikula village which is about 160 km off capital Dhaka in the north-west part of Bangladesh. Mr. Samson H Chowdhury then ventured into a partnership pharmaceutical company with three of his friends in 1958. 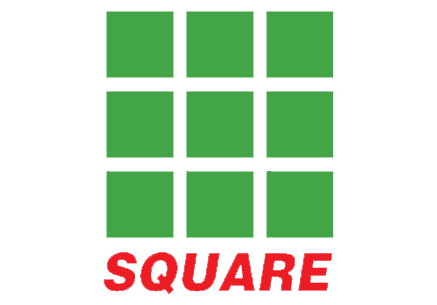 SQUARE today is a name not only known in the Pharmaceutical world, it is today a synonym of quality- be it consumer product, toiletries, health products, textiles, agro vet products, information technology and few more. All these were possible due to his innovative ideas, tireless efforts, perseverance and dedication with self confidence that contributed to his successful achievements. Now the name "SQUARE” inspires trust. Under his dynamic leadership, SQUARE is set to continue its progress globally. Square started out as a small scale pharmaceutical venture in 1958. It was a partnership effort of four young and enterprising men whose determination and passion saw it through the turmoil of the incipient period. By its fourth year, Square turned into a profit making organization. 1974: Technical Collaboration with Janssen Pharmaceutica, Belgium, a subsidiary of Johnson and Johnson Intl, USA. 1982: Licensing agreement signed with F.Hoffman-La Roche Ltd., Switzerland. 1985: Achieved leadership in pharmaceutical market of Bangladesh among all multinational and national companies. 1994: Initial public offering of Square Pharmaceuticals Ltd’s shares. : Square Toiletries ltd. becomes a private limited Company. 1995: Chemical Division of Square Pharmaceuticals Ltd. Starts production of pharmaceuticals bulk products (API). 1997: Square Pharmaceuticals Ltd won the National Export Trophy. : Debut of Square Textiles Ltd.
1998: Second unit of Square Textiles Ltd. is established. 2000: Square Spinnings Ltd starts its journey. 2001: Square Knits Ltd. is established. : Square Fashions Ltd starts its operation. : US FDA/ UK MHRA standard Dhaka unit of Pharmaceuticals goes into operation. : Square Consumer Products Ltd starts its operation. : Square Infomatix is established. : Square Hospitals Ltd is incorporated. 2005: New State-of-the-Art Square Cephalosporins Ltd. goes into operation: built as per US FDA/ UK MHRA requirements. 2006: Square Hospitals Ltd starts its journey. 2007: Square Pharmaceuticals Ltd., Dhaka Unit gets the UK MHRA approval. 2008: Of Square Pharmaceuticals Ltd. starts SVPO (Small Volume Parental & Ophthalmic) unit, built as per US FDA requirements, goes into operation.